The Central Electricity Regulatory Commission proposes to lower the trading prices for renewable energy certificates (REC). Industry people in a hearing on July 19 lamented the move would affect renewable energy capacity addition in the country. As per the REC scheme, state electricity distribution companies (discoms) unable to meet their green energy targets can purchase RECs through bidding to meet the shortfall. Since monetary value of REC is equal to the environmental attribute of renewable energy fed to the grid, the scheme is expected to provide producers additional revenue from the market. But the commission plans to cut the rates to keep the rec price in line with the existing scheme of fixed premium that states offer to renewable energy producers. The plan is to reduce the floor price of solar certificate by 17.7 per cent, from Rs12 to Rs 9.8 per kWh, and the ceiling price by 20 per cent. The floor and ceiling prices of non-solar power like wind and biomass will be cut by 6.7 per cent and 10.7 per cent (see graph). The revised price will be applicable for three years from April 2012. Project developers present during the hearing said a three-year period would create negative sen¬timent among investors. They demanded to fix REC prices for at least seven years, given the bank loan repayment schedules. Analysts say the proposed cut could have been avoided had the Ministry of New and Renewable Energy adhered to the target of 15 per cent electricity from renewables by 2020, as stated in the Prime Minister’s National Action Plan for Climate Change (NAPCC). Instead, the ministry’s target is to source just 10 per cent electricity from renewables by 2022. “A higher national target would have prompted the commission to aggressively promote renewable energy capacity addition ensuring minimum price revisions,” says Umashankar S, researcher at Centre for Science and Environment, a Delhi non-profit. The revised price will hit solar power developers, says Lavleen Singal, president of Acira Solar. “Even at the present prices, very few are willing to invest in this uncertain rec scheme,” he adds. R B Mishra of Acme Telepower, a solar power producer, says the commission used invalid assumptions for determining the floor and ceiling prices for solar. It overrated plant load factors (PLF is the actual generation of a plant against the rated capacity). The industry is yet to establish PLFs of 23 per cent in solar thermal and 19 per cent in photovoltaic, as assumed by the regulators, he adds. pelase refer to the link below, the said news is yet to be confirmed?????? The said news is not official yet. The CERC is still yet to make their statement on it. 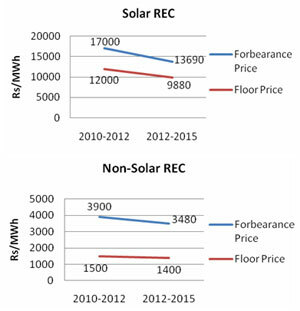 The CERC has finally announced the price revisions where floor prices for non-solar has remained intact. However, the solar floor prices have been reduced. Please refer to the link below in the CERC website.